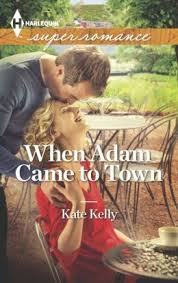 When Adam Came to Town by Kate Kelly is a September 2013 Harlequin publication. I was provided a copy of this book by the author in exchange for an honest review. Sylvie has returned home from Toronto after her father has a heart attack. She's a famous artist who is creatively blocked and suffering from panic attacks. Adam has just moved to the small town after inheriting his grandmother's home. He plans to renovate the house and is working at the café owned by Sylvie's family. When Sylvie finds out her father intends to sell the café due to financial strain, she becomes very upset and tells her father she wants to move back home and run the café . He doesn't support this idea. For one thing he thinks Sylvie needs to move back to Toronto and use her talent as an artist and for another thing Sylvie doesn't know how to cook. So, Sylvie talks Adam into helping her learn how to cook, a task he reluctantly agrees to. Sylvie also plans on raising money to keep from having to sell the café and begins organizing a fund raiser. Sylvie has many issues to work through, one of them being the need to uncover the story behind her mother's death in a car accident. There was more to the story and everyone has kept their mouths shut about it for Sylvie's sake. But, the time has come for her hear the truth no matter how much she may dread it. For Adam, he is also trying to sort things out in his life. His dangerous and hardened father died and his mother is a junkie. Adam himself has had a hard time of it and thinks it's best Sylvie never knows about that part of his life. But, as the two begin to spend more time together they begin to slowly fall in love and that means a day of reckoning will come. I thought this was a charming small town love story. Sylvie has not found happiness in the city, nor has fame and recognition brought contentment. Sylvie has a nice looking boyfriend that is very sweet and treats her well, but he bores her to tears. Obviously, there is something going on with Sylvie that is psychological and the trigger was her father's heart attack. Sylvie's family is close but complicated. Her good friend Teresa is a red headed fire ball that calls it like she sees it and has her own troubles in life. Then there is Adam. He is a bit of an enigma. We know he's not rolling in money and so we have to wonder why he's chosen to move into his Grandmother's home when there isn't a lot in this small town to challenge him once the house is renovated. I have to confess, I never guessed Adam's darkest secrets. When you do find out about his past you will feel terrible for him and also feel proud of him for getting a handle on his life and making something of himself. Sylvie will try your patience at times. She is independent , stubborn, and a little high strung. She misses her creative side but thinks she can live without painting and make a life for herself at the café and feel contented. But, is she only lying to herself? What will happen if her creative block goes away? Will she be happy with Adam and living in a small town running a café ? Some of the secondary characters have their own story and the only flaw with the book was that some of those issues were left unresolved. It is possible that these characters will get their own story in the future. Otherwise this was a very enjoyable contemporary romance. I give this one a B+. Kate Kelly has had a love affair with books her entire life. Writing came in fits and starts, and she didn’t take it seriously until her forties. Now she can’t get along without it. 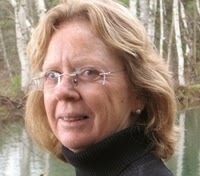 She has finaled in the RWA Golden Heart and has been the recipient of the RWA Daphne du Maurier award. She has the good fortune to live on the east coast of Canada with her husband (the children have flown away). She writes, grow herbs and perennials and sails when the wind blows her way.